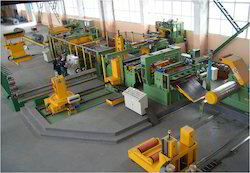 PRESS ROOM AUTOMATION Slitting Lines are designed to perform exceeding top quality standards in slitting of metal strips. High output / throughput by means of rigorous tooling time minimisation and high production speeds. High level of cutting accuracy by means of high-precision knife shaft bearings. Burr-less cuts and high number of cuts at the slitting shears with minimum deflection of the cutter shaft. High level of line availability and long lifespan by means of exclusive use of select components of renowned manufacturers. Affordable solution for in-house slitting requirements. Low Inventory carry cost for Raw Material. On-site service available by our specialists. One-stop shop for customised system solutions including line automation. Flexible line design as per customer requirements and use of experiences of other customers. 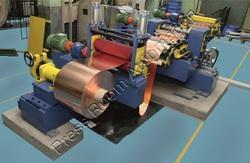 PRESSS ROOM AUTOMATION supplies heavier Slitting Line for CR material. PRESSS ROOM AUTOMATION supplies heavier Slitting Line for HR material. 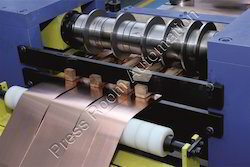 PRESS ROOM AUTOMATION Slitting Lines are designed to perform exceeding top quality standards in slitting of metal strips for copper and brass. This line is idea for manufacturing Transformer Radiators, Copper Radiators, Special Copper Material, etc. 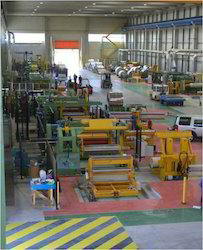 PRESS ROOM AUTOMATION has designed some compact slitting lines to do production for inhouse coil processing. PRESS ROOM AUTOMATION designs & manufacturers Slitting Line accurately which results in Slitting in high accuracy.